Every year here at MITM, we ask for you tell us what you think are the greatest love songs of all time. It’s not hard to think of romantic songs as we play them all the time. The hard part comes from figuring out how to choose a favorite. 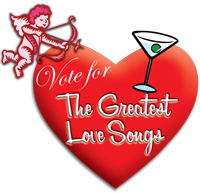 Did you vote in our 12th annual Valentine’s Day 50 Greatest Love Songs Countdown? Did your song make the list? Tune in at Noon PT, February 14th to find out!